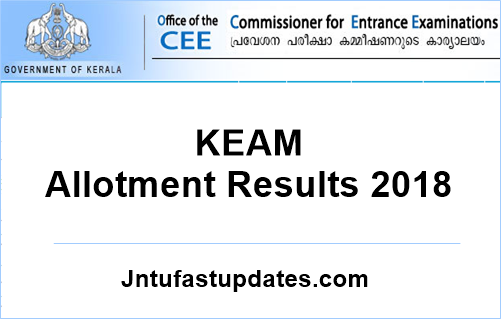 KEAM Trial Allotment Result 2018: Commissioner for Entrance Examinations (CEE), Kerala has conducted the Kerala Engineering, Architecture and Medical Entrance Exam (KEAM) examination for all the aspirants seeking admission in Engineering, Medicine and Architecture courses. Huge number of students seeking admissions in Engineering / Medicine courses have applied for KEAM Examination and attempted it with great ambition to get the seat. This year the competition for KEAM examination was doubled. Many number of students have competed for KEAM examination. The CEE Board has recently announced the results for KEAM examination and also allowed the students to select the options. Students those have participated in option entries were curiously waiting for KEAM Trial allotment results 2018. The latest updates from board shows that, the KEAM Trial allotments published on June 27th. Hence candidates can visit the CEE official website, http://www.cee-kerala.org to check the KEAM Trial allotment list 2018. Kerala Engineering, Architecture and Medical Entrance Exam (KEAM) examination is the entrance test that is going to be conducted by Commissioner for Entrance Examinations (CEE), Kerala. This is the yearly examination. Students after their Intermediate / Plus 2 will attempt this examination to get admission in Engineering / Medicine / Architecture courses. Annually candidates interested in attempting this examination are rising in a notable way. This year huge number of candidates have applied for Medical and Engineering Streams. Candidates selection will be dome on merit basis. Candidates obtained the best ranks will be given the first priority for admissions. The Centralised Allotment Process will be done through the Single Window System (SWS) to give allotments to the various courses and colleges under the Engineering/ Architecture/ Pharmacy/ Medical streams in the State, based on the options submitted by the candidates who have been included in the rank list of the Engineering/ Architecture/ B.Pharm/ MBBS & BDS /Medical & Allied/Ayurveda courses for the year 2018, prepared by the Commissioner for Entrance Examinations (CEE), Kerala. This is a system of ‘Allotments through Online Submission of Options’. The options are willingness of a candidate who qualified with a rank in the rank lists of KEAM-2018 to join a course-college combination prioritized as per his/her aspiration and desire subject to the conditions specified in Clauses 6 and 9.7.5. KEAM 2018 Trial Allotment & Last Ranks Published. Step 4: Then enter the details of application number, roll number and click on submit button. Step 5: The allotment list will be displayed on screen. Step 6: Check the list and take a printout for reference. When will second keam allotment will publish. Please help me. I am obc, SEBC and BH student. Also oec(eligible for edicational concession) I come from a bad financial set up. I came in trial allotment,in sree Narayan medical college ekm. We can't afford the huge fee. Then what is the procedure for fee during admission in private college. Please reply…. I didn't get the page of showing result of trial allotment 2018.when it will publish? Did keam trial allotment published? DID KEAM TRIAL ALLOTMENT LIST PUBLISHED? Do you have an update about trail allotment list, when will it be published? Now the time is 11:15 pm.Why the trial allotment is not coming? What time the allotment will be published??? It's 10pm now.When will KEAM trial allotment result come? Are the commission aware of today's significance that today is the day to publish the keam trial allotment! when did the keam trial alotment published? What is the time for publishing trial allotment result or is it was already published? What is the time for publishing of keam 2018 trial allotment results today? ?